1. Any circumscribed surface or space. See also: regio, region, space, spatium, zone. 2. All of the part supplied by a given artery or nerve. 3. A part of an organ having a special function, as the motor area of the brain. /ar·ea/ (ār´e-ah) pl. a´reae, areas [L.] a limited space; in anatomy, a specific surface or functional region. association areas areas of the cerebral cortex (excluding primary areas) connected with each other and with the neothalamus; they are responsible for higher mental and emotional processes, including memory, learning, etc. auditory areas two contiguous areas of the temporal lobe in the region of the anterior transverse temporal gyrus. Brodmann's areas areas of the cerebral cortex distinguished by differences in arrangement of their six cellular layers; identified by numbering each area. embryonic area see under disc. hypophysiotropic area the hypothalamic component containing neurons that secrete hormones that regulate adenohypophysial cells. Kiesselbach's area one on the anterior part of the nasal septum above the intermaxillary bone, richly supplied with capillaries, and a common site of nosebleed. motor area any area of the cerebral cortex primarily involved in stimulating muscle contractions, often specifically the primary somatomotor area. prefrontal area the cortex of the frontal lobe immediately in front of the premotor cortex, concerned chiefly with associative functions. premotor area the motor cortex of the frontal lobe immediately in front of the precentral gyrus. 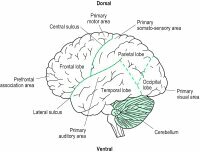 primary areas areas of the cerebral cortex comprising the motor and sensory regions; cf. association a's. primary somatomotor area an area in the posterior part of the frontal lobe just anterior to the central sulcus; different regions control motor activity of specific parts of the body. area subcallo´sa , subcallosal area a small area of cortex on the medial surface of each cerebral hemisphere. area of superficial cardiac dullness a triangular area of dullness observed on percussion of the chest, corresponding to the area of the heart not covered by lung tissue. thymus-dependent area any of the areas of the peripheral lymphoid organs populated by T lymphocytes, e.g., the paracortex in lymph nodes, the centers of the malpighian corpuscle of the spleen, and the internodal zone of Peyer's patches. thymus-independent area any of the areas of the peripheral lymphoid organs populated by B lymphocytes, e.g., the spleen lymph nodules and the lymph nodes. watershed area any of several areas over the convexities of the cerebral or cerebellar hemispheres; at times of prolonged systemic hypotension they are particularly susceptible to infarction. Wernicke's area , Wernicke's second motor speech area originally a term denoting a speech center on the posterior part of the superior temporal gyrus, now used to include also the supramarginal and angular gyri. (in anatomy) a limited anatomical space that contains a specific structure of the body or within which certain physiological functions predominate, such as the aortic area and the association areas of the cerebral cortex. 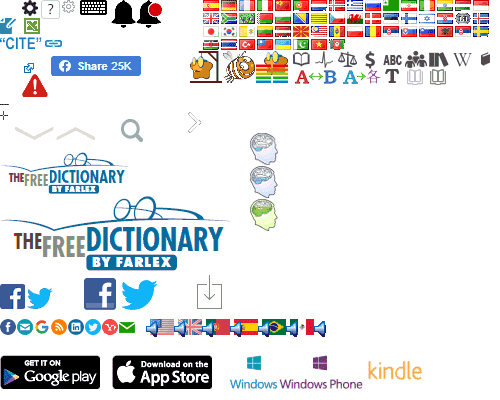 As refers to functional regions of the brain, the complete noun is X area of the cerebral cortex, as in prefrontal area of the cerebral cortex, motor area of the cerebral cortex, and so on; the most common “short” form is either X area or X cortex. 1. Any limited surface or space. A part of the brain or retina having a particular function. 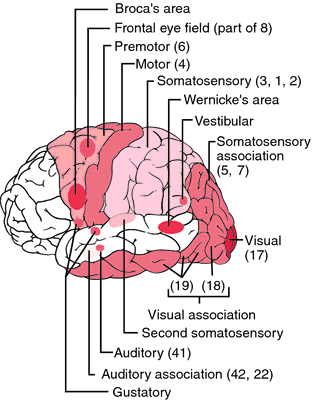 Brodmann's area's Areas of the cerebral cortex defined by Brodmann and numbered from 1 to 52. Areas 17, 18 and 19 represent the visual area and visual association areas in each cerebral cortex. area centralis See macula lutea. area of comfort Zone of comfort. See Percival criterion. extrastriate visual area See visual association areas. fusion area See Panum's area. Panum's area An area in the retina of one eye, any point of which, when stimulated simultaneously with a single point in the retina of the other eye, will give rise to a single percept. Its diameter in the fovea is about 5 minutes of arc and increases towards the periphery (Fig. A17). Syn. fusion area. 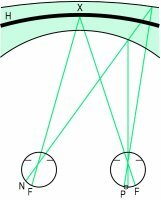 See retinal disparity; horopter; retinal corresponding points; Panum's fusional space. striate area See visual area. visual area 1. Any region of the brain in which visual information is processed. 2. This is Brodmann's area 17 in each occipital lobe. It contains six layers of cells numbered 1 to 6 from top, layer 4 being subdivided into three sublayers 4A, 4B and 4C. Layer 4C receives inputs from the photoreceptors in the retina via the lateral geniculate bodies. There are also some afferents to layers 1 and 6. The primary visual area is identified by a white striation (line of Gennari) on each side of the calcarine fissure. This white line appears in the middle of the fourth layer of the visual cortex and is composed of fibres from the optic radiations. Syn. primary visual area; primary visual cortex; striate area; striate cortex; V1; visual cortex. 3. It also refers to all parts of each occipital lobe related to visual functions. Syn. prestriate cortex. See cortical column; occipital cortex; calcarine fissure; lateral geniculate bodies; cortical magnification. visual association area's They are the parastriate area (Brodmann's area 18) and the peristriate area (Brodmann's area 19) of the occipital cortex surrounding the visual area. Areas 18 and 19 are subdivided into multiple zones (called V2, V3, V4, V5, V6, etc.). They receive projections from the striate cortex. They are also connected to other areas of the cortex and via the corpus callosum with areas 18 and 19 of the opposite hemisphere and receive feedback information. It has been shown that V4 and the inferotemporal cortex or IT (components of the ventral or temporal cortex) receive substantial input from the parvocellular pathway. V5 (also called middle temporal cortex or MT, a component of dorsal or parietal cortex) receives input from the magnocellular pathway. Processing that occurs in the visual association areas helps to interpret the message that reaches the visual area and to recall memories of previous visual experiences (Fig. A18). Syn. extrastriate visual area; extrastriate cortex; prestriate cortex (these terms actually represent all the regions outside the striate cortex where visual processing takes place); secondary visual cortex. See agnosia; magnetic resonance imaging fMRI; prosopagnosia; magnocellular visual system; parvocellular visual system. 1. [TA] Any circumscribed surface or space. n (denture-bearing area, denture-supporting area, stress-bearing area, stress-supporting area), the portion of the oral structures available to support a denture. n the surface of the oral structures recorded in an impression. n the soft tissues along the junction of the hard and soft palates on which compression, within the physiologic limits of the tissues, can be applied by a denture to aid in its retention. n an area of excessive displacement of soft tissue by a prosthesis. n the portion of the body on which a skin, bone, tooth, or other graft is placed. n the portion of the surface of the oral cavity under prosthesis on which pressures are reduced or eliminated. n the prepared surface of a tooth or fixed restoration into which the rest fits, giving support to a removable partial denture. n (rugae zone), that portion of the hard palate in which rugae are found. n the areas of the maxillary and mandibular edentulous ridges best suited to carry the forces of mastication when the dentures are in use. See also area, basal seat. n the entire space in which the dental hygienist moves and works while treating a patient. This includes the instrument tray and dental chair, unit, and light. n a grouping of enveloped, helix-shaped RNA viruses implicated in a relatively benign form of meningitis (lymphoctyic choriomeningitis; severe encephalitic forms do occur rarely) that affects young adults. pl. areae, areas [L.] a limited space or plane surface. areas of the cerebral cortex (excluding primary areas) connected with each other and with the neothalamus; they are responsible for higher mental and emotional processes, including memory, learning, etc. specific occipital and preoccipital areas of the cerebral cortex, distinguished by differences in the arrangement of their six cellular layers, and identified by numbering each area. in the embryo includes heart and pericardial rudiments. the area of the retina, dorsal to the optic papilla, along the optical axis. Here the retinal vessels are missing. In cattle the area is poorly defined as two areas; a rounded area concerned with binocular vision and a horizontal strip concerned wuth monocular vision. in anencephaly the cerebral hemispheres are replaced by a sheet of tissue composed largely of blood vessels called the area cerebrovasculosa. that part of the renal crest or renal papilla at which the papillary ducts open into the pelvis. the central part of a spinal meningomyelocele. It is a raised, reddish protuberance devoid of skin and consists of spinal cord with a surrounding vascular network. that area of the cerebral cortex which, on brief electrical stimulation, shows the lowest threshold and shortest latency for the production of muscle movement. an area on the surface of a viscus that has no serosal covering. 1. the part of the piriform lobe of the brain associated with olfaction. 2. a more general area including the olfactory bulb, tract and trigone. the opaque area of the embryonic disk of the fertilized avian egg surrounding the area pellucida; it forms some extraembryonic structures. the clear central part of the developing embryonic disk in a fertilized avian egg. Produces the embryo's tissues. the cortical area of the piriform lobe of the brain. areas of the cerebral cortex comprising the motor and sensory regions. an area of the brain in which pathological conditions may occur without producing clinical signs. the part of the glottis between the vocal cords. Q. What does it mean when you have breast cancer in three different areas? My friend just found out that she has breast cancer in her right breast but three different lump types of cancer in one breast, and it has affected her lymph nodes at least two of them. What are her chances and what stage cancer would that be? She is going to be having a mastectomy and chemo. A. Did they biopsied the lumps? Are they sure they are cancerous? If so that means it might got metastasized, the cancerous cells can move around in the blood stream and then just start “hook” on an organ and continue multiplying. That is a malignant and dangerous situation. Q. I have terrible pain in my groin area when i try to walk. Any clues? Is the pain aggravated by coughing or straining? Do you feel any bulge? In this case, it may be an inguinal hernia, which is quite common in men. You can read more here (http://www.nlm.nih.gov/medlineplus/ency/article/003111.htm), and consulting a doctor may also be wise.